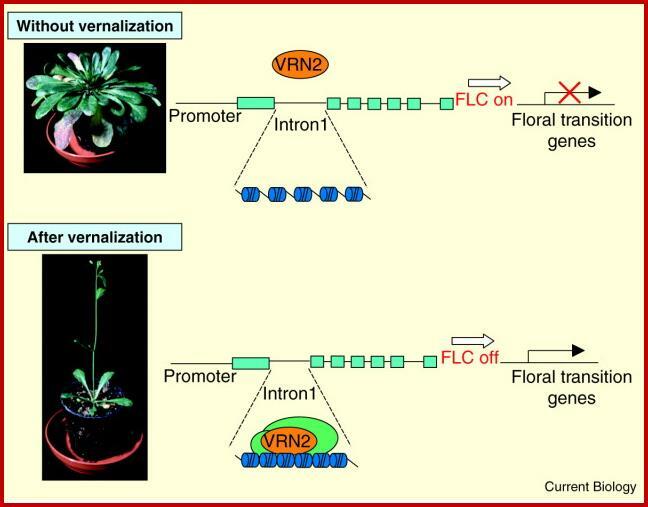 Vernalization is a process that promotes flowering by cold temperature treatment given to a seed that has imbibed water or to a growing a plant. Like photoperiodism, vernalization is also an inductive effect leading to flowering sometime after the cold temperature treatment. If cold temperature treatment is not provided to cold requiring plants they may either show delayed flowering or remain vegetative. Not all plants flower when subjected to the correct photoperiod. In many plants, temperature has a profound influence on the initiation and development of reproductive structures. In the annual plants, growth is started in the spring, flowers are developed in the summer and the fruit and seed are produced in the fall. The influence of temperature in the annual plant is secondary to that of light. However, the biennials present an entirely different situation. They remain vegetative the first growing season and after prolonged exposure to the cold situation. They remain vegetative the first growing season and after prolonged exposure to a cold treatment, the majority of these plants would remain vegetative indefinitely. However, with prolonged exposure to low temperature, followed by the correct photoperiod, cold-requiring plants will flower. A biennial can be made to flower during first growing season if it is exposed artificial cold treatment followed by the correct photoperiod and temperature. Chourd described the phenomenon as acquisition or acceleration of the ability to flower by a chilling treatment. Agronomists, horticulturists and gardeners long recognized a relationship between temperature and flowering, however J. Gustav Gassner (1918), a German, working with rye (Secale cereale, cv. Petkus) was the first to point out that temperature was critical during early stages of seed germination. He also showed that presence or absence of temperatures during this critical stage determines the success or failure of flowering and fruiting. Winter Petkus rye is sown in the field in the fall of year, where it germinates and sends up a few leaves. Further growth is checked for several months by low winter temperatures. In many instances, the plant is covered by snow. When the temperature moderates in the spring, the plants resume growth, flower and produce a grain crop during summer. Spring Petkus rye, on the other hand, is sown in the spring, at which time it germinates and immediately proceed through vegetative and reproductive growth to give a grain crop that is harvested in the summer. If winter rye is planted in spring, the seeds germinate and produce vegetative plants, however flower initiation does not occur until late in growing season. The grain crop is prevented by low temperature during the fall. Gassner found that the low temperature requirement of winter Petkus rye can be satisfied by subjecting imbibed seeds to chilling temperatures between 2 to 5°C for 5 to 6 weeks. If the chilled seeds are planted in the speing, they grow and flower like ordinary Petkus rye. Trofim Denisovich Lysenko, a Russian geneticist coined the term vernalization, from Latin translated to English as springisation, for conversion of winter varieties to spring or summer vaerities by cold treatment. The term is equivalent to a Russian word Jarovizzcija meaning transformation of winter forms into spring. The plants receiving low temperature treatment are referred to as vernalized (vernal referring to spring). Melchers with help of grafted annual and biennial varieties of Hysocyamus niger, cooled stem apex of one, found that both plants flowered. Schwabe in his experiments with Chrysanthemum, kept the plant apex warm and provided cold treatment to the rest of the plant, found that plants did not. Purvis showed that if the apices are removed from imbibed embryos and provided with sucrose and minerals, these can be vernalized. Lang (1965) transplanted a vernalized meristem to an un-vernalized plants and found that the un-vernalized plant flowered. But when the meristem from an un-vernalized plant is grafted onto a vernalized plant after removal of the vernalized meristem, the plant remained vegetative. Gregory and associates working with cereals conceived that vernalization process consists of several partial reactions. Cells within the shoot apex perceive low temperature, whereupon metabolic processes are initiated that trigger the synthesis of a flower stimulus. The flower stimulus then transforms localized areas within the shoot apex to flower primordia. Further developmental changes lead to flowers and fruits. G. Melchers suggested that low temperature induces the formation of a growth substance: vernalin, which is responsible for initiating the synthesis of the flower stimulus. The vernalin is yet to be isolated but there is indirect evidence in support of existence and transportation of vernalin. Major support comes from grafting experiments by Melchers. If a plant part, leaf or stem of a vernalized henbane (Hyoscyamus niger) plant is grafted to a non-vernalized henbane plant, the non-vernalized henbane flowered. 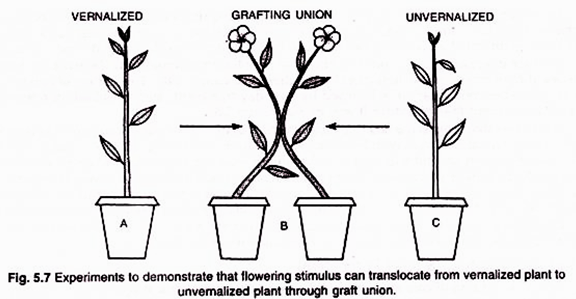 Since, many substances including florigen are known to move across a graft union therefore florigen may be the vernalization stimulus. The transmission of florigen was ruled out as a result of experiments by Melchers and Lang. They grafted an un-vernalized henbane (Hyoscyamus niger) plant to a Maryland mammoth tobacco plant, the henbane plant flowered irrespective wheather tobacco plant received photoinductive cycle or not. The stimulus transmitted from tobacco plants on non-inductive cycles as well as inductive cycles. Since tobacco plant is not a cold requiring plant, the stimulus (vernalin) should be present in the absence of cold treatment.